The Country Music Association held a press conference this morning to announce the 2018 inductees into the Country Music Hall of Fame, Johnny Gimble, Ricky Skaggs and Dottie West. Gimble will be inducted in the "Recording and/or Touring Musician" category, which is awarded every third year in rotation with the "Songwriter" and "Non-Performer" categories. Skaggs will be inducted in the "Modern Era Artist" category, while West will be inducted in the "Veterans Era Artist" category. 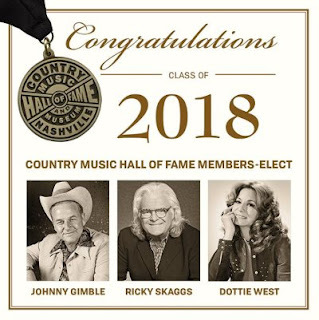 Gimble, Skaggs and West will increase membership in the coveted Country Music Hall of Fame from 133 to 136 members. "This honor is the highest achievement in our industry, and each of this year's inductees have helped define Country Music throughout the decades," said Sarah Trahern, CMA Chief Executive Officer. "We're thrilled to congratulate them today and welcome them into the distinguished circle that is the Country Music Hall of Fame." Upon receiving the news, Gimble's family shared their immediate reactions: "Touched. Happy Hearted. Proud of Papa. Grateful. Honored. Blessed. Amazingly Graced!" "I was totally shocked and I burst into tears when I heard that I was going to be the newest inductee into the Country Music Hall of Fame," said Skaggs. "When I came to Nashville in 1980, I came to play music and hopefully get a record deal. All of that happened, but I never dreamed that I'd ever be a member of this hallowed Hall. 'Why me? And why now?' was going through my mind. There are so many others that have inspired me, encouraged me, ones that I've truly learned from, and ones that have made such great contributions to Country and Bluegrass music. I'm humbled and very grateful to soon be listed among my many heroes." "The whole West family is full of emotion," said West's daughter, Shelly West. "When I got the news that Dottie was being inducted, I don't remember if I was laughing or crying louder! My heart just swelled as I knew that Mom's fans would soon hear this sweet news. Our deepest thanks to our great and hardworking CMA folks and our special friends at the Country Music Hall of Fame. Although she sings in the angel's band these years, she has needed her resting home on earth. She will have that home here at the Country Music Hall of Fame, sharing her love with all." A formal induction ceremony for Gimble, Skaggs, and West will take place at the Country Music Hall of Fame and Museum in the CMA Theater later this year. Since 2007, the Museum's Medallion Ceremony, an annual reunion of the Hall of Fame membership, has served as the official rite of induction for new members. CMA created the Country Music Hall of Fame in 1961 to recognize noteworthy individuals for their outstanding contributions to the format with Country Music's highest honor. "This year's class of inductees is notable not only for their indelible individual achievements, but also for the extent to which they have aided other artists' greatness," said Kyle Young, Country Music Hall of Fame® and Museum Chief Executive Officer. "Ricky Skaggs, Dottie West, and Johnny Gimble are revered for their open-minded approaches to music, but beloved because of their open-hearted approaches to life." The press conference was hosted by Country Music Hall of Fame member, 13-time CMA Awards winner and reigning CMA Entertainer of the Year Garth Brooks, as well as three-time CMA Awards winner Trisha Yearwood. The announcement was made in the rotunda of the Country Music Hall of Fame in Nashville and livestreamed on CMA's YouTube channel. One common thread between the music of Jimmie Davis, Bob Wills, Merle Haggard, Willie Nelson, and George Strait is that each man's musical odyssey would eventually carry them to the rotunda of the Country Music Hall of Fame. A key ingredient in each of those iconic artists' musical paths was the fiddle playing of Johnny Gimble. Now, the legendary musician will be represented alongside these artists as a 2018 inductee into the Country Music Hall of Fame in the Recording and/or Touring Musician category. Gimble was born May 30, 1926 in Tyler, Texas. The music bug bit him early, as he was playing the fiddle by age 10. Before the 1940s, he was playing professionally as a member of a band called the Rose City Swingsters alongside his brothers. One of his early gigs was playing music during Jimmie Davis' campaign for Governor in Louisiana. After serving his country in World War II, Gimble returned to his native Lone Star State and performed on local radio shows. His musicianship would merit the attention of Bob Wills, who hired him to be a member of his Texas Playboys in 1949, an association that would last on and off through the 1960s. His fiddle work would be heard on hundreds of classic hit recordings over the years, with Marty Robbins' 1952 chart-topper "I'll Go On Alone" being one early example. His tasty licks would grace classic hits from Connie Smith and Conway Twitty. In 1970, Gimble added his touch to Merle Haggard's seminal A Tribute to the Best Damn Fiddle Player in the World (or, My Salute to Bob Wills). Over the years, Gimble's work was heard on television series such as "Hee Haw" (where he was a member of the Million Dollar Band) and "Austin City Limits." He was also a key element of the 1973 disc Superpickers from Chet Atkins, which featured (in addition to Atkins) Country Music Hall of Fame members Hargus "Pig" Robbins and Charlie McCoy. In 1979, Gimble once again took on the role of a road musician, with a two-year stint in Willie Nelson's band - also appearing in the singer's "Honeysuckle Rose" film. In 1982, he went in front of the camera to portray the man who gave him his first major musical break - Bob Wills - in the Clint Eastwood theatrical release "Honkytonk Man." All along the way, Gimble continued to make melodies with his fiddle that found their way into the hearts of millions of Country Music fans around the world. In 1983, a rising young artist who grew up enamored by the music of Wills named George Strait utilized Gimble's magic on his Right or Wrong album. This working relationship would prove to be one of the longest associations of his career. He would appear on 10 of Strait's albums through 1992, becoming a key part of Strait's early sound on such hits as "Baby's Gotten Good At Goodbye" and "All My Ex's Live In Texas." Gimble's work earned him 15 CMA Awards nominations, including 14 nominations for Instrumentalist/Musician of the Year from 1975 through 1990. He won five times, in 1975, as well as 1986-87, and 1989-90. Along the way, he also tallied two Grammy trophies. Johnny Gimble died on May 9, 2015 at the age of 88. Fans can celebrate the collection of legendary musicians as it grows a little larger with the induction of Johnny Gimble into its hallowed ranks. Born July 18, 1954 in the hills of Eastern Kentucky, Ricky Skaggs was influenced by a wide variety of sounds and artists. The bluegrass music of his region set him on his musical trek early, playing a mandolin given to him by his father, Hobert, at age five. By the age of 10, he had already shared the stage with heroes Bill Monroe and Flatt & Scruggs, honing his skills as a player and as a singer in many bands around the area in the years that followed. In the early 1980s, he set out on his own solo journey, signing with Epic Records in Nashville. His first single, "Don't Get Above Your Raising," was a remake of a Flatt & Scruggs classic. Released during the peak of the "Urban Cowboy" movement, the record made it to No. 16 on the Billboard Country singles chart. His third single, a stone-cold Country performance of another Flatt & Scruggs single - "Crying My Heart Out Over You" - topped the chart in April of 1982. Whether it was making classic Country sounds by Ray Price or Webb Pierce cool to younger generations, or releasing such musically exhilarating sets as Highways and Heartaches or Country Boy, Skaggs became a musical tour de force in the 1980s. He racked up awards just as quick, from the CMA Awards Male Vocalist of the Year as well as the Horizon Award in 1982 to the Entertainer of the Year trophy just three years later. As trend-setting as he was as a recording artist, where Skaggs dazzled the most was on the stage. Whether at the Grand Ole Opry (where he became a member in 1982) or across the pond (site of his landmark 1985 Live In Londondisc), his performances are truly magical. He also demonstrates wizardry in the studio, producing not only his records but sets from acts such as The Whites and Dolly Parton, as well as the recent Love Remains disc from Hillary Scott & The Scott Family. In the mid-1990s, he made a promise to Bill Monroe, as "The Father of Bluegrass Music" was nearing the end of his life, that he would help to keep the flame of the music that Monroe created alive. Beginning in 1997 with the formation of Skaggs Family Records, he did just that with albums that introduced those sounds that impressed him as a youngster to a new and receptive audience. Chart numbers - though plentiful in the 1980s - simply don't do the Skaggs story justice. Neither do the eight CMA Awards wins, 15 Grammys, and 13 IBMA (International Bluegrass Music Association) Awards trophies. One need only look at the sheer magnitude of the artists that Skaggs has shared a microphone with over the years - ranging from Flatt & Scruggs to Bruce Hornsby to modern-day superstars such as Keith Urban - to see the evolution and musical genius of Ricky Skaggs, from teenage prodigy to the stage of the Grand Ole Opry, and now, his fitting induction into the Country Music Hall of Fame. If ever there was an example of a Country Music artist rising above the odds to achieve stardom, it would be Dottie West. The events of her life flowed like the lyrics of the songs that became favorites of fans around the world. Her penchant for composing - as well as identifying - lyrics that struck a chord with listeners carried her on a journey that includes the Grand Ole Opry, television stardom, and now, her induction into the Country Music Hall of Fame. Born Dorothy Marie Marsh on October 11, 1932 near McMinnville, Tennessee, she endured an abusive childhood at the hands of her father while working as a teenager in her mother's restaurant. Music became her outlet to escape the real world, as she began playing guitar with a local band while in high school. After graduation, she continued her education with a music scholarship at Tennessee Technological University in Cookeville. It was there she would meet Bill West, whom she would marry. The young couple moved to Cleveland, Ohio, where she began to appear on a local television program. All the while, West continued to keep her heart and mind focused on that musical mecca just a few miles up the road from her hometown - Nashville. She made repeated trips to music city in hopes of getting her songs heard throughout the 1950s. By 1959, she achieved her goal - a recording contract with Starday Records. Though recording success would elude her there, her compositions began to be heard around town, as she toured and became friends with such performers as Patsy Cline. In 1963, superstar Jim Reeves recorded her song "Is This Me?" and the song became a No. 3 record on the Billboard Country singles chart. She soon signed with RCA Victor, where she recorded with Reeves on "Love Is No Excuse" and then hit solo stardom with the self-penned "Here Comes My Baby." The song helped West become the first female artist in Country Music history to win a Grammy and launched a run of hits that included "Would You Hold It Against Me" and "Paper Mansions." Two of West's hits for RCA Victor - "Country Girl" and "Country Sunshine" - were featured in television campaigns for Coca-Cola, with the latter winning a coveted Clio award for television advertising. In 1976, West signed with United Artists Records, where she found an immediate hit with "When It's Just You and Me." Not long after, she was finishing up a recording session one afternoon when the next artist who happened to show up early was Kenny Rogers. The two began to harmonize on a song that she was going to record, and the rest was history. That record, "Every Time Two Fools Collide," topped the charts in short order and served as the catalyst for a pair of Gold-selling albums, back-to-back CMA Awards for Vocal Duo of the Year, and one of the most successful tours in Country Music history. The duets with Rogers also propelled West's solo career to new heights, with songs such as "Are You Happy Baby?" and "A Lesson In Leavin'" becoming fan favorites. In addition to her own recorded work, she was instrumental in the careers of several other artists, musicians, and songwriters including Grand Ole Opry members Larry Gatlin, Jeannie Seely, and Steve Wariner. As she entered her fifties - an era where women in the format typically slowed down - she continued to plow ahead in new creative fields including film and theater. On her way to an appearance on the Grand Ole Opry in August of 1991, West was involved in an automobile accident. Despite three surgeries, and a valiant fight for her life, she succumbed to her injuries at the age of 58. Now, the career trajectory of Dottie West places her in the same destination that her previous duet partners of Jim Reeves, Kenny Rogers, Don Gibson, and Jimmy Dean have landed - the Country Music Hall of Fame.